One thing this whole thing hasn't been very clear on: Is it an account-wide unlock, is it "pick your favorite character and give it to them," or is it "ha ha, the likely-throwaway character you leveled to 40 gets it?" Can confirm, I made "Generic Fighting Claws Lady" to obtain the perk, got the perk (after re-logging like it suggests on Release Notes), and was able to use the emotes on other characters. this hurts me deep in my soul for reasons beyond words can express. Not the emote itself though... that's fine. not worth it for just an emote even account wide to waste a character slot on and time. but please all enjoy have fun thought as it's really a throw away event thing anyways. It's a problem for name completion, though. If I use start "/e danc" it's now leaving about ten dances off the end of the list (it used to leave off two). 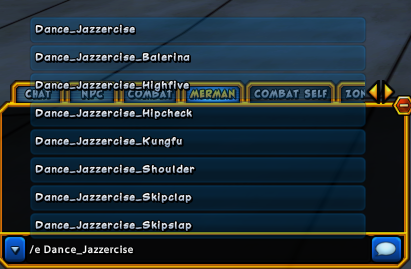 I'd rather they were just named jazzercise_ instead of dance_jazzercise.